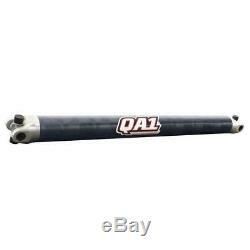 QA1 JJ-11231 Dirt Late Model Carbon Fiber Driveshaft, 37 In, No Yoke. Changing track conditions don't have to affect your performance. That's why QA1 offers two carbon fiber driveshaft options for super late models, limited late models, and Wissota and IMCA dirt late models. While both provide unmatched performance on any track, they each have their unique features designed to provide extra benefits in specific conditions. Our 3.2 XMA style driveshaft takes advantage of rough conditions, providing extra alignment to avoid binding, whiles the 2.25 driveshaft utilizes TractionTwist technology to get better traction on slick tracks. Get an even higher edge up on the competition by using both and switching them out based on track conditions. Specifically engineered for tacky or rough conditions, the 3.2 dirt late model carbon fiber driveshafts offer extreme U-joint misalignment (XMA). The tube on this shaft has a higher torsional stiffness that results in less twist, which is great for heavy, fast, or rough tracks where traction isnt limited. The XMA style provides more U-joint misalignment than other designs on the market, and this prevents binding near the pinion yoke, allows more rear suspension articulation and provides more clearance under deceleration, which is especially critical when the car is on the bars during corner entry. QA1 specially winds the driveshafts with 3M Matrix Resin that is exclusive to QA1 driveshafts. 3M Matrix Resin uses spherical nanoscale silica that provides improved abrasion resistance and longevity, higher compressive strength and minimal water absorption for increased torque capacity and longevity. This resin is what gives a QA1 driveshaft its distinctive blue tint. The driveshafts have a uniform wall thickness created by optimum fiber lay up that ensures high RPM stability as well as extreme torque capacities. A thoroughly engineered surface protection is used to withstand extreme racing environments and provide a worry-free performance. These driveshafts also feature Spicer Life Series® Universal Joints that are high strength alloy and provide durability, high torque capacity and are sealed for maximum strength and no maintenance. The forged yokes are precision CNC machined and are specially developed for QA1s 11 step bonding procedure that ensures a better balance and minimal material waste. Prevents binding near the pinion yoke. More clearance under deceleration - especially critical when the car is on the bars during corner entry. Made with 3M Matrix Resin for improved abrasion resistance, longevity and higher strength. Spicer Life Series® U-joints come standard for their durability and high torque capacity and are sealed for maximum strength and no maintenance. Lighter, stiffer, stronger and safer than steel or aluminum driveshafts. Available in a variety of lengths and with or without a slip yoke. Does NOT include 8 slilp yoke. Please take advantage of the add to cart button on each listing to get everything in your cart prior to completing checkout. Speedway Motors is Americas Oldest Speed Shop® and has been a trusted source for specialty rodding and racing products and friendly expert advice for more than 67 years. Repack the item in a sturdy box, include a copy of your invoice and complete the form on the back of the invoice. Speedway accepts full responsibility for the accuracy of our listings and product representation. The item "QA1 JJ-11231 Dirt Late Model Carbon Fiber Driveshaft, 37 In, No Yoke" is in sale since Thursday, January 3, 2019. This item is in the category "eBay Motors\Parts & Accessories\Car & Truck Parts\Transmission & Drivetrain\Universal Joints & Driveshafts". The seller is "speedway_motors" and is located in Lincoln, Nebraska. This item can be shipped to United States.